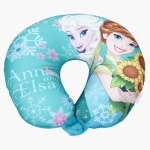 Let your little one stay relaxed and feed her conveniently using this neck pillow. Soft and curvy, it can be used to sleep snugly as well. The Frozen print on the front adds to its appeal.